Radiohead producer Nigel Godrich has shared a rejection letter from Abbey Road studios from when he was a teenager. 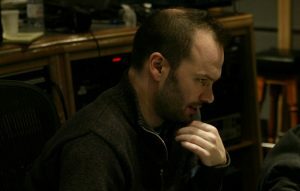 Godrich has worked on every Radiohead album since 1997’s ‘OK Computer’ and is commonly dubbed the “sixth member” of the band. Taking to Twitter recently, Godrich posted a photo of a rejection letter from Abbey Road that he received in 1990, when he was 18. “Meanwhile, we would like to take this opportunity to thank you for your interest in the company”. The letter even gets Godrich’s first name wrong, addressing the letter to “Neil”. Ha! Actually back at that time I wrote about 100 letters asking for a job – because that’s how many studios there were in London! “Back at that time I wrote about 100 letters asking for a job – because that’s how many studios there were in London!” Godrich added on Twitter. Meanwhile, Kasabian’s Serge Pizzorno has revealed his “life-changing” love of Radiohead. He continued: “‘This is the best tune I’ve ever heard!’ And when the album came out it was constant. Had a huge influence on me, on what a rock band could be. To make a classic album and then go, ‘Nah, we’re gonna make this now,’ I always remember that. The post See Radiohead producer Nigel Godrich’s Abbey Road rejection letter appeared first on NME.